Mustaffa Ibrahim fasts from sunrise to sunset during the holy month of Ramadan and is still putting in work. LORMAN, Miss. – Every year, Mustaffa Ibrahim from the Alcorn State University football program goes 29-30 days without eating or drinking from sunrise to sunset. Ibrahim celebrates Ramadan which is observed by Muslims world-wide. Fasting is obligatory during the holy month in addition to increased prayer and other religious practices. However, it doesn’t stop Ibrahim from working out or improving his game or body. During the day, the 2017 All-Conference Second-Team offensive lineman frequently works out at his high school (Ridgeland HS) where he conditions and does footwork drills. “I’ve grown up around Ramadan and it’s what I believe. Though at the same time, I also want to keep in football form and in shape,” Ibrahim said. 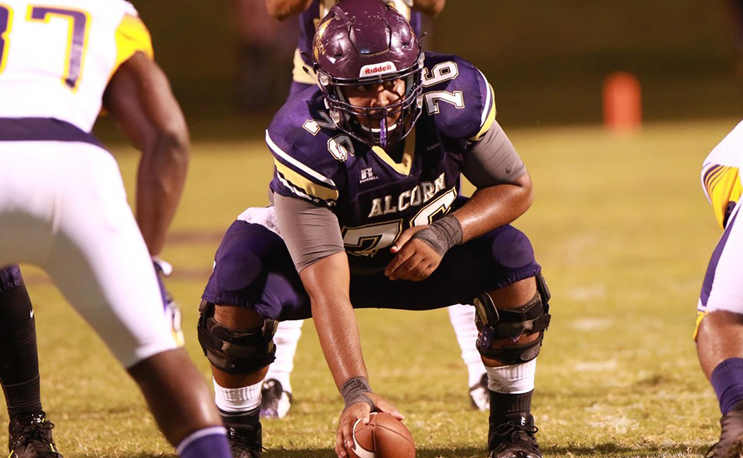 Ibrahim, who carries a 3.0 GPA and is pursuing a degree in sports management, returns for his junior season in 2018 as Alcorn’s starting center. He played in the middle of an offensive line that helped Alcorn lead the SWAC in both total offense and rushing offense last year. “Mustaffa is a humble, hard-working student-athlete who has excelled in the classroom and on the field at Alcorn. He motives his teammates in a positive manor and is one of our leaders. His work ethic will lead him to success well beyond his years at Alcorn,” said offensive coordinator Ryan Stanchek who also coaches the offensive line. Ibrahim, from Ridgeland, Mississippi, heavily aided the Braves in racking up 461.3 yards per game and 237.4 rushing yards per outing last year – both marks were top-10 in the country. He also blocked for running back De’Lance Turner who broke the school’s single-season rushing record with 1,357 yards on the year which was second-most in the country. In 2016, Ibrahim was part of an offensive line that saw Alcorn rank top-10 in the nation in sacks allowed, giving up just 0.90 per game. He also contributed to the Braves ranking No. 17 in the country and second in the SWAC in rushing offense. “I’m really excited for the upcoming season. I can’t wait just to get back out on the field, meet my new teammates and play. We have a really good group of newcomers coming in and the goal is to win the SWAC,” Ibrahim said. Ramadan this year began May 15 and ends the evening of June 14. The Braves open the 2018 season on the road at Georgia Tech on Saturday, Sept. 1 at 11:30 a.m. (CT).